Well, after lots of re-do's and many trips to Topeka, we have our "final" (ya right) paperwork headed to Astrakhan. We had a very hard time getting the correct wording from a CPA for our Financial Statement. Almost two weeks of drafts, final drafts, semi-final drafts... But, I think we've got it now! It's all a bit confusing, but apparently when Russia receives these documents we will be officially registered with the Department of Education in Astrakhan. Before now we were just considered assigned to that Region. It's hard because we seem to be learning these details as we complete each step instead of beforehand. Oh, well. Russia's adoption is moving very quickly right now. Our agency, CHI, completed three adoptions in the first two weeks of January. That's crazy fast. Two families left today for Astrakhan. They are both requesting kids under 18 months. So then, it's just us. Last week when I was having my quite time with the Lord, I felt this urgency to pray for the Power of God to work in the heavenly realms. There is major battle going on that we cannot see. I have been praying for God's unseen strength to break through strong-holds in Russia and in the US. I would love for you to join with us as we pray for all that paperwork to fall into the right hands. Mostly, we are praying for our little girl in Russia who needs us. She needs to be home. We want her here. God knows her name and is preparing her for us. We are preparing for her, too. Her room is totally ready now. Paint, curtains, decorations - Will (our 8 year old) even helped me put sheets on the bed! We're ready, Lord! Bring it on!! We talked with Children's Hope last week. They said we are FIRST on the list to adopt a toddler! 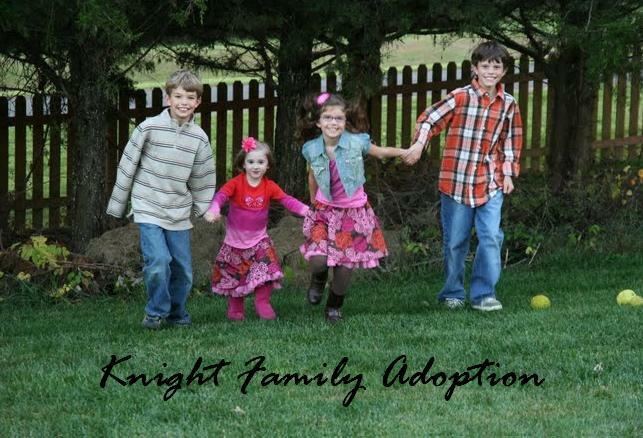 There are two other families wanting to adopt babies under 18 months, but that does not effect us. We have a conference call scheduled for this morning. It will include me and Rob, and the three reps in St Louis who are working with our family. This also includes the actual transalator who has direct contact with Russia. Primarily we are going to talk about where we are right now in our adoption process. All of the CHI people seem to be a little confused about the "referral" we got in September - supposedly to travel in October, etc. I know we're confused, that's for sure! Hopefully we'll get everyone on the same page and figure out what has happened. Happy New Year! We had a wonderful Christmas and are looking forward to 2009 with great expectations! We met with our new social worker this morning. Our adoption agency Children's Hope International has closed their branch in Kansas, but they are still operating in Missouri. Because of this we have to change some of our original documents to the new social agency Family Christian Services. Also, sadly to say, our Home Study documents from last year are expiring, so we have to re-do much of our paperwork. Our new social worker is very sweet. We are glad for that. She has been with Family Christian Services for over 25 years. So, we are hoping we will not have to change again in the future! Our CHI representive in St. Louis will be back in the office on Monday. Hopefully we'll hear some type of update next week.